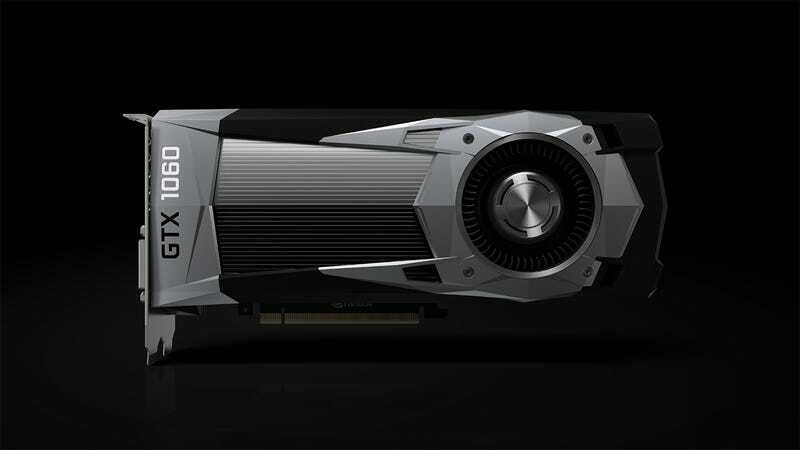 Launching July 19 and priced for mass consumption, Nvidia’s Pascal-powered GTX 1060 promises power comparable to the company’s former flagship GTX 980 and twice the energy-efficiency in virtual reality. Now that Nvidia’s gotten the high-end GTX 1080 and mid-range GTX 1070 out of the way, it’s time for the mainstream event. The GTX 1060 is aimed at the massive I-just-want-to-play-PC-games market. It’s the card that will knock a chunk of cash off the price in boutique PC builders’ system configurators. If graphics cards were sold at the grocery store, it would be in every checkout lane with the lighters and candy bars. While built with a different Pascal chip than its more expensive brothers (GP106 to their GP104), the GTX 1060 still offers all the benefits of Nvidia’s FinFET 16nm process. Its single power connector only draws 120 watts of power, making it ridiculously efficient. It boasts 1,280 CUDA cores, comes with 6GB of GDDR5 memory running at 8Gbps, and its 1.7GHz boost clock should be easily overclocked into the 2.0GHz range. The GTX 1060 should be a pretty amazing entry-level virtual reality card. Like the more expensive cards in the line, it supports Nvidia’s Simultaneous Multi-Projection technology, which makes it easier for multiple instances of the same image to be delivered to both eyes of a VR headset. The technology is being integrated into both Unreal Engine and Unity, so expect a ton of games to support it going forward. The GTX 1060 also supports Nvidia’s Ansel in-game photography tech, allowing players to take high-fidelity images in supported games—including 360 degree VR-ready shots. Players of Mirror’s Edge Catalyst and The Witcher III will be able to start playing about with Ansel later this month. Nvidia third-party partners will begin rolling out their versions of the GTX 1060 on July 19 for $249. Nvidia’s own Founder’s Edition, created with premium components and priced so as to not piss off Nvidia’s third-party partners will also be available on July 19 for $299. Last month AMD released the $199/$249 Radeon RX 480, aiming it at the mainstream user with an eye on VR. Our Techspot friends’ benchmarks placed it slightly below the GTX 980 in terms of pure performance. The GTX 1060 is aimed at providing GTX 980 performance more efficiently and at a lower price point. It’ll be interesting to see how these two stack up once the comparisons start rolling in. Expensive graphics cards with ridiculous amounts of power are nice, but the battle between card makers is won or loss at the mainstream price point.